This lovely Renaissance church was built on open ground below Todi to house an image (14th century) of the mystical marriage of St Catherine (see below), after it performed a miracle in 1508. The image, which became known as the Madonna della Consolazione, attracted a flood of pious donations. Bishop Basilio Mascardi sanctioned the formation of the Compagnia di Santa Maria della Consolazione, which was charged with the construction of a church to house it. This proved to be a protracted process: the miraculous image was finally translated to the high altar in 1617. The anniversary of the miracle is still celebrated each September 8th. The centrally-planned church has a semi-circular apse to the north and three polygonal subsidiary apses. Each apse has a semi-dome, and pillars between them support the square terrace and the central dome above. Its design might well have been influenced by the ideas of Leonardo da Vinci, as expressed, for example, in sketches now contained in the Codex Ashburnham. These ideas had certainly influenced the design (1506) by Bramante for St Peter's, Rome. Monsignor Pietro Camaiani explicitly named Bramante as the architect when he visited Santa Maria della Consolazione in 1574. No earlier reference to Bramante in relation to the project is known. ✴only in 1511, when the existing semi-circular apse had been built, it was decided that the other three should be polygonal. Cola da Caprarola was documented for the last time as architect of Santa Maria della Consolazione in 1512. ✴The sculptor Ambrogio da Milano was documented in the team in 1516-20. ✴The Lombard Francesco da Vita carved many of the capitals of the pilasters in 1522. ✴Another Lombard master, Filippo di Giovanni da Melide continued this work, receiving payments in the period 1522-38. The last of these related to the arches of the apses. In 1531, the the Compagnia di Santa Maria della Consolazione resolved to cede the church to a community of monks. They initially decided to approach the Benedictines of San Pietro, Perugia, but subsequently offered it to a community of Hieronymites (hermits of St Jerome) at Fiesole. Antonio di Sangallo il Giovane was consulted in Orvieto in 1531 and travelled to Todi in 1532: one of his sketches, which survives in the Uffizi Gallery, Florence, suggest that he advised on the construction of conventual buildings around the main apse at this time. However, these plans came to nothing. Francesco Casella was sent from Todi to Orvieto, Perugia and Rome in 1585 to inspect models that experts there had made: these were presumably models of the cupola by (respectively) Ippolito Scalza, Valentino Martelli and William of Portugal. 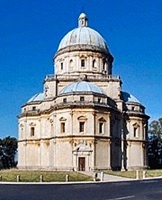 Valentino Martelli was paid for designs for the windows of the cupola in 1589. The cupola was finally closed in 1607. The eagles (1601-4) at the four corners of the terrace represent Todi, and the two smaller eagles that each holds represent the subject cities of Amelia and Terni. The central dome was closed in 1606, the year in which Bishop Angelo Cesi consecrated the church. Construction can be considered to be complete when the cross was put in place on the cupola. A sacristy was built on the north side of the church in 1613. It was often criticised because it ruined the symmetry of the church, and demolished by popular demand in 1862. ✴a giant order of pilasters at the crossing. The high altar (1612) was rebuilt in 1634, perhaps to a design of Andrea Polinori. This image on the high altar is sometimes attributed to the monk Giovanni di Ranuccio degli Atti (died 1330) or alternatively (and more probably) to Nicolò di Vannuccio. It originally stood in a tabernacle close to the nearby Monastero di Santa Margherita, and it became particularly venerated after it liberated Todi from a vicious serpent in 1457. The tabernacle was walled over later in the century to protect it from the consequences of the civil war between the Atti and the Chiaravalle. The image was re-discovered in 1508 when two workmen demolished the covering wall. One of them wiped it with his handkerchief. and when he then used this to wipe an eye in which he was blind, he miraculously recovered his sight. As noted above, the venerated image was translated to its current location in 1617. These twelve giant statues are arranged in fours in each of the three subsidiary apses. Citizens of Todi who escaped the plague of 1630 commissioned this huge wooden statue of St Martin (Pope Martin I, who came from Todi) to the left of the main entrance. This altarpiece from the high altar of Santa Maria della Consolazione, which is now in the Cappella Gregoriana, San Fortunato, is signed by Andrea Polinori and dated by inscription. It depicts the coronation of the Virgin with SS Michael, Peter, Paul and John the Baptist.